We grind, spoon and never sprinkle - pinching only when at the stove. There's nothing like a crystal salt. Cornish rock salt bashed in a pestle and mortar, transferred to a salt cellar and always pinched and sprinkled. 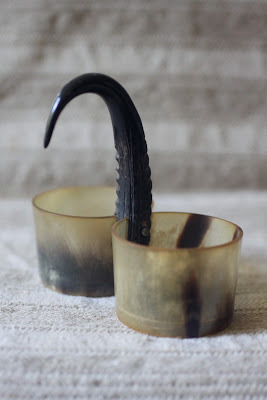 Love your horn salt cellar. Oh my! How lovely! 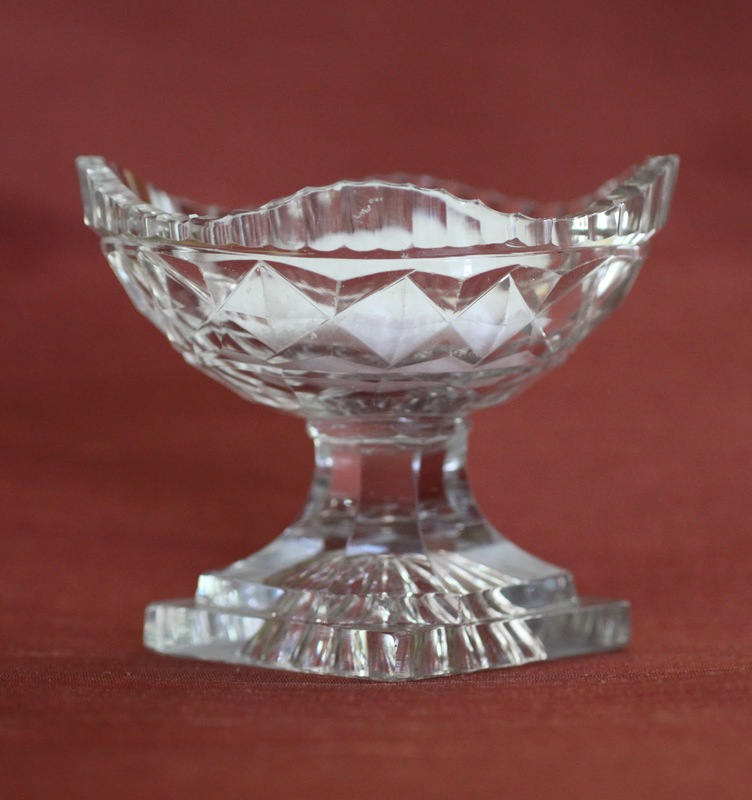 My sister would probably sell one of her children for the Mercury glass salt cellars! Although, I grew up with salt cellars, I can't remember what they looked like. I think they must have been cut glass. We did use mother of pearl spoons with them. I remember those very well. I do not currently use salt cellars, my sister keeps that tradition alive. I have some silver and cobalt salt cellars, but I mostly use salt in cooking, so i pour it in my hand and sprinkle from there. it's so humid here in the mid-atlantic, that it clumps when/if you leave it out. We are pinchers in my house. I have a few antique cellars but our everyday salt is a small blue and white dipping bowl. 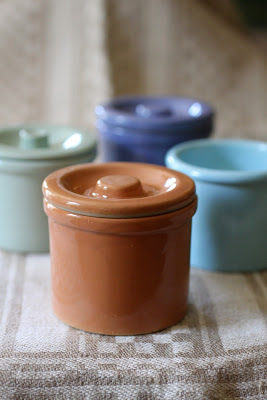 We pinch and sprinkle from a variety of small containers -- Chinese bowl; black glass jar; salt-glazed ceramic -- mostly Kosher salt. There are a variety of salts in the spice cabinet including my favorite Maldons hauled back in my suitcase from London. 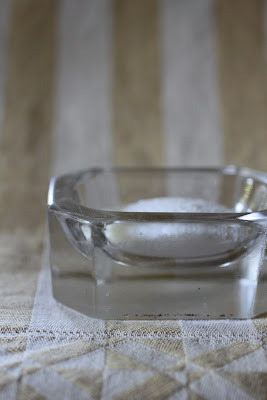 In the summer when we have so many fresh vegetables for salads or to grill I love a sprinkle of salts infused with herbs especially Eatwell Farm's Rosemary salt with its base of French Atlantic Grey Sea Salt. Funny thing.....I have a germ-phobic sister-in-law who is a little horrified when we use fingers to pinch and sprinkle. Even a reminder that salt kills "germs" hence it's function as a preservative won't quite satisfy her. 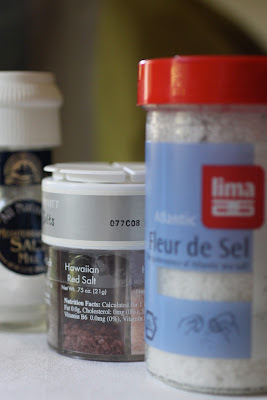 I use maldon sea salt which I keep in just a pyrex container with blue rubber lid - moves from kitchen to table that way. Not very pretty perhaps but it works for me! 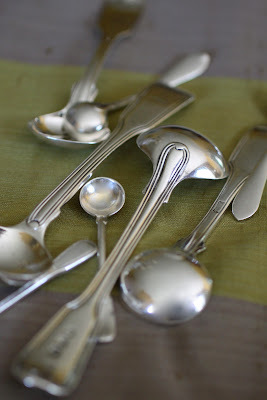 I love the mother-of-pearl spoons. They're fragile but so lovely. Oh yeah! I had forgotten about the Chinese salt cellars with the matching pepper thingies! Did Mom get them all or did she split them with Auntie? There is nothing "below the salt" about your marvelous collection of salts! 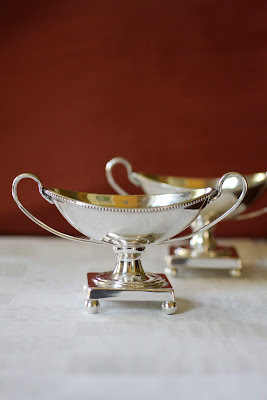 So happy to see these little jewels have not been relegated to obscurity (such as the salt spoons have been - and I agree with you on that point), and provide such a stylish note to Darlington's dinner table. 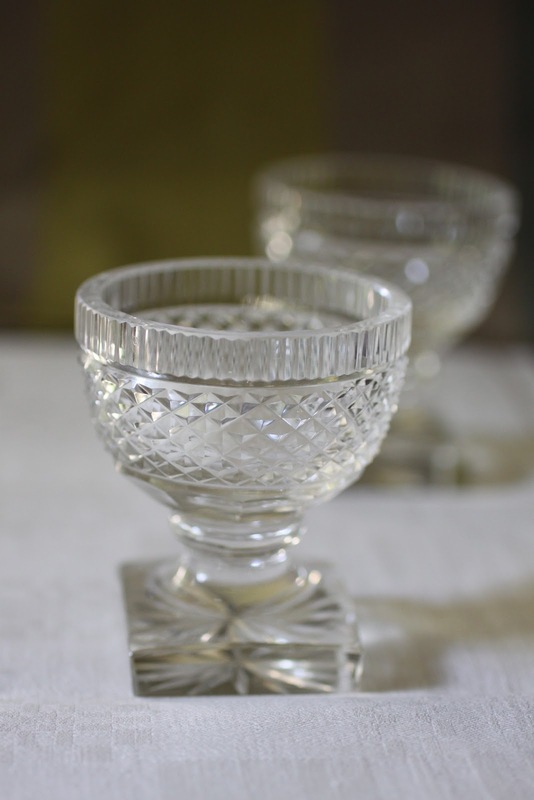 The Regency glass salts are particularly breathtaking, as is the Sheffield pair. 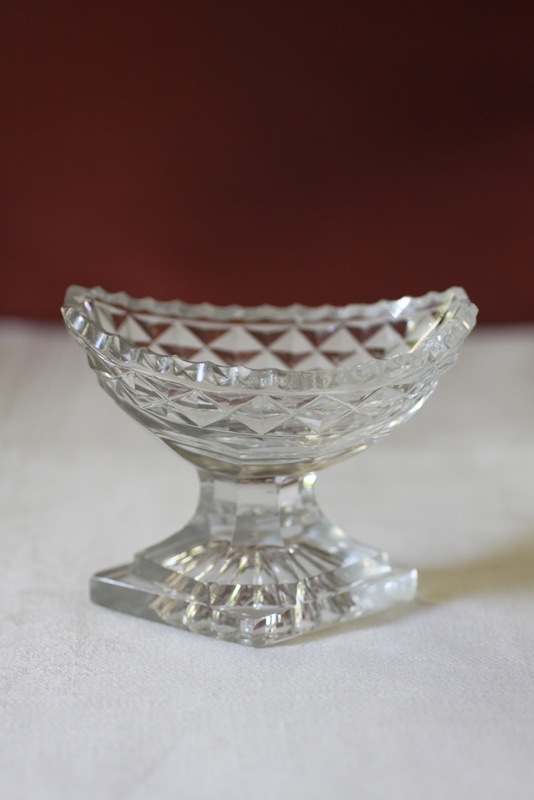 I wonder how many models of glass salt boats were produced in Regency England and Ireland (I have a small collection but none of my examples duplicate yours, although all are similar in form and cut). Which of the ones you show examples of in your photo essay do you believe to be "in the Regency style"? I'd be curious to learn as not much written or pictorial information is available. Again, thank you for sharing your wonderful collection. Viewing them perked up my Monday morning. 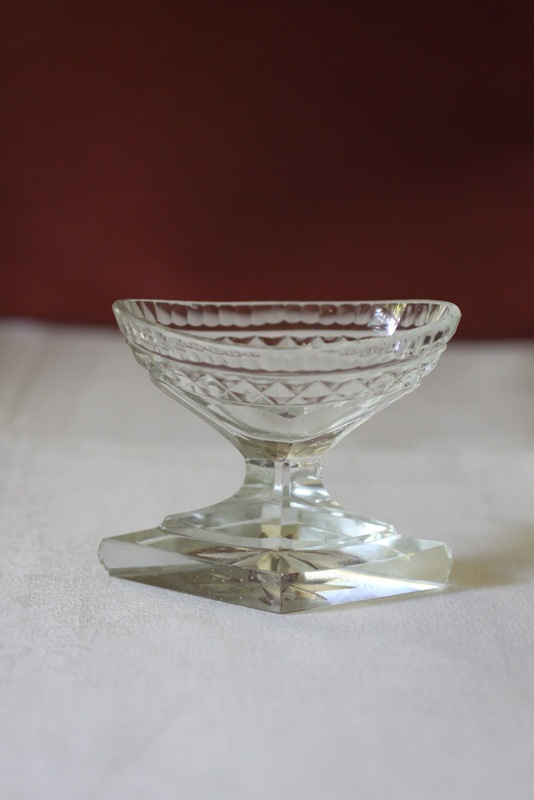 The top pair of cut glass salts are, I believe, later. The top left are, I think, Edwardian and the top right are later Victorian. The bottom singles ae Regency. We commited "pinchers"...however, with the exception of when we grind an extremely coarse salt. We are fortunate to have access to a variety of salts. One of our favorites is a LAKE salt (rather than a salt from the sea). The lake salt has a natural buttery flavor which is divine on popcorn and eggs. Lake salt? What a lovely idea! You are men of infinite refinement. I just pour the stuff out of the box. I'm a pincher, love your silver salt cellars with the little ball feet. 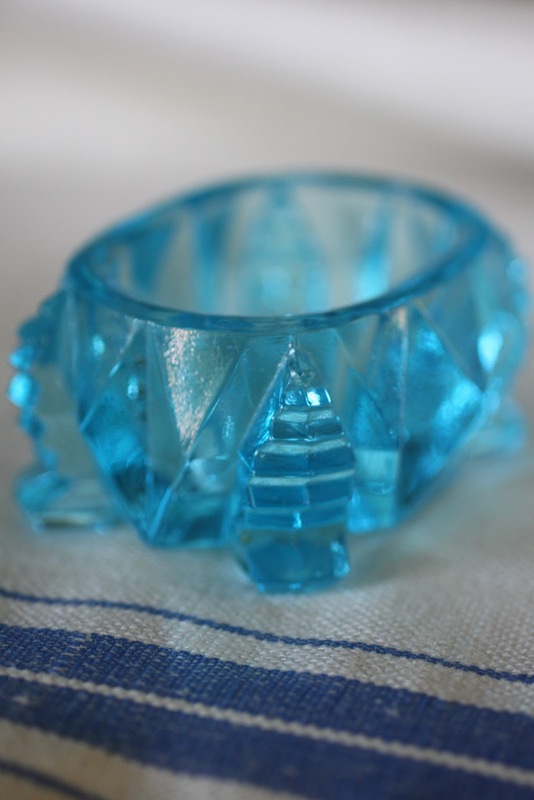 Apparently as a toddler I threw my mother's dark blue glass salt cellar inserts against the wall for the pleasure of seeing them break. I have improved somewhat since then. It'slike Christmas ornaments, I suppose...how much pressure can I apply before they break? I provide the spoon, I have to say, but if it's just we two we grind. And it must always be sea salt. Yes, the man in the antique shop who told us he was relocating to Hudson, New York to whom I dropped the inevitable name, "Ah," he said, about yours, "a beautiful house!" I love your collection, beautiful and utilitarian. I use a salt pig (yes, horrible name) on my range filled with sea salt...grab pinches while cooking. 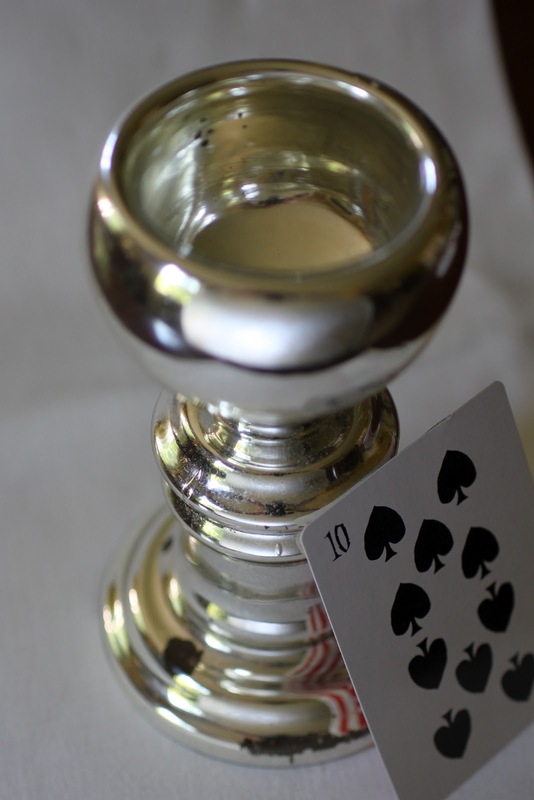 It's an open face, bell shaped 'holder'. I also love, albeit modern, but LOVE my Puegot salt and pepper grinders for the table (from ?Williams Sonoma) So many guests have purchased a set after visiting. goodness, Reggie! this post gave my blood pressure a boost. I wholeheartedly agree, the cellar spoons are an unnecessary concern for convention. a pinch is perfect. 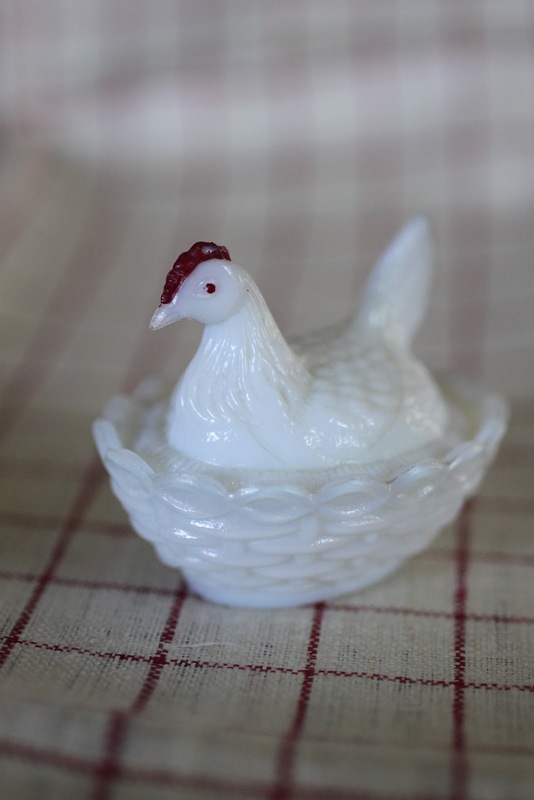 We pinch as well!Love all your vessels.......I too have a few.I didnot know the small chicken with cover was for salt!Makes perfect sense however.I sell those when I come across them at my little HEN HOUSE.Now, I know thanks to YOU! We do both but I certainly don't have the lovely and varied collection of cellars that have! I was so happy to see that little chicken! I've had one for years that belonged to my husband's family and had no idea what it was used for. Now I know and will use it accordingly, thanks for the fun post. I shimmy and shake. I am at the moment rather fond of white Pangasinan salt and Himalayan salt. On a salad, sublime. The shovel-tipped salt spoons work more efficiently than the round ones, on the same principle as the sugar shovel. Pinching can be the most accurate way to distribute salt, but closed-top shakers can provide some defense against high levels of humidity. And for a view of some contemporary salt cellars, take a look at these wooden birds by Tom Hill at Velvet DaVinci Gallery in San Francisco. I grind or pinch, depending upon the salt. I find shaking is too inaccurate. We pinch as well, from a repurposed sugar bowl. If we have company I'll add a stray demitasse spoon. With it, a one-handed thumb-action pepper mill. I love the silver boat shaped dishes. Do you have corresponding mustard pots for your salts? Growing up, we used a shaker/grinder for casual family meals. 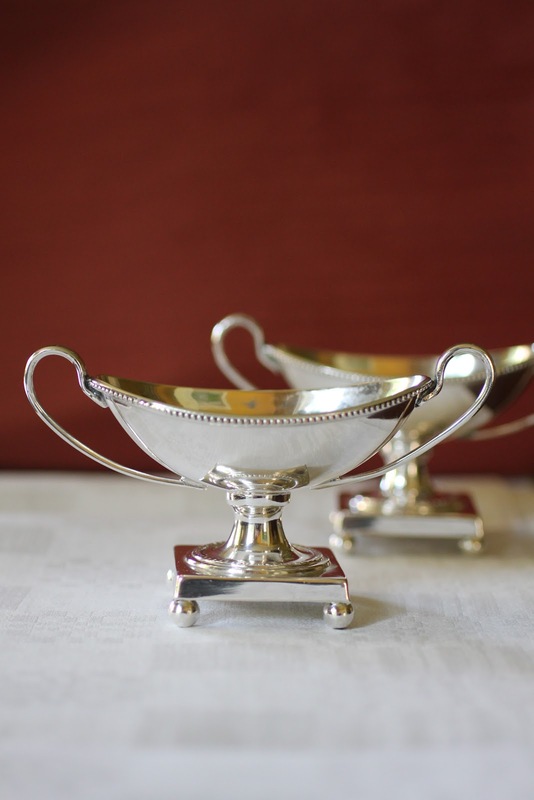 For anything else, my mother used tiny silver salt and pepper shakers at each place setting. 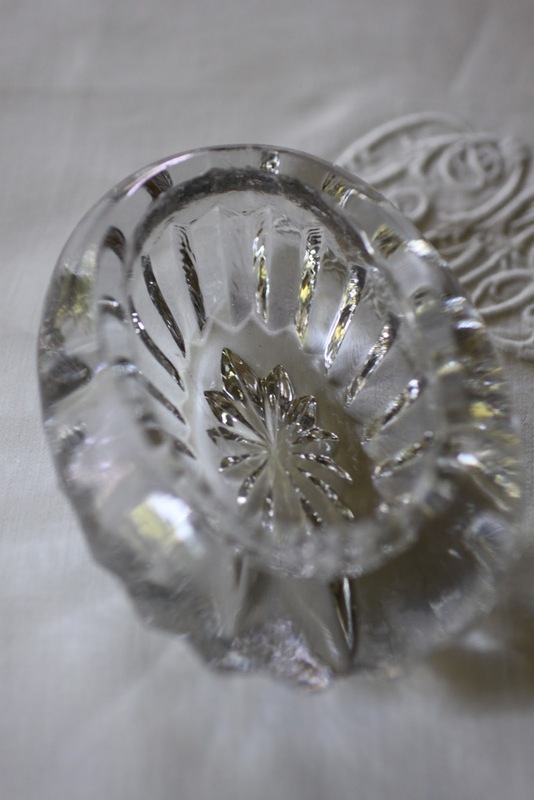 My grandmother, however, used crystal salt cellars with tiny crystal and silver pepper shakers at each place setting. 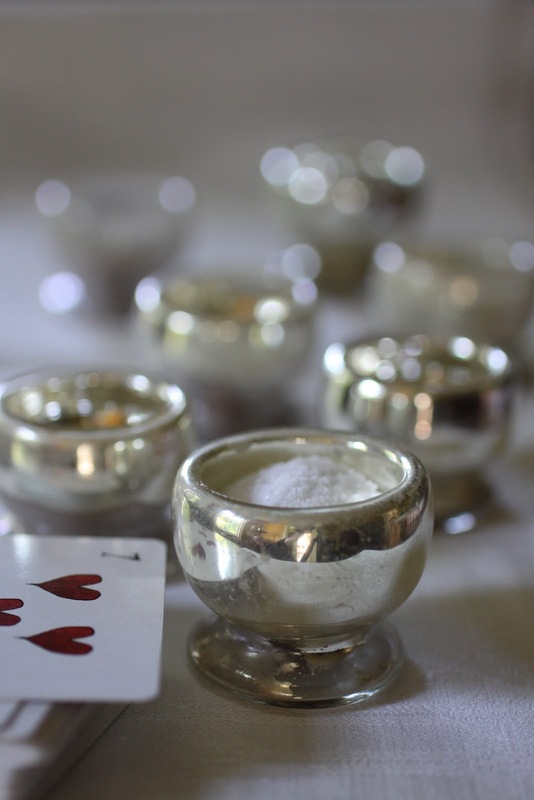 The salt cellars had silver salt spoons. At my table, we use a shaker/grinder left to my by an aunt. 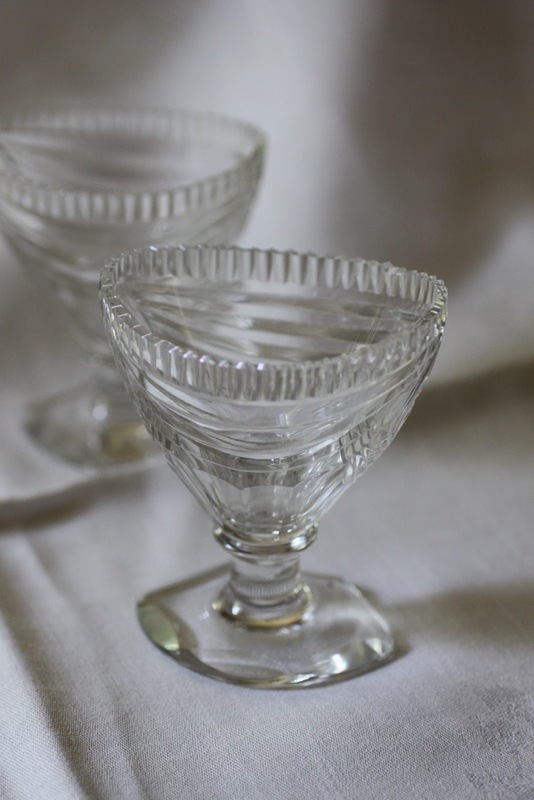 Although I did inherit my grandmother's cellars and shakers, I don't use them for casual dining. I come from a long line of "pinchers" and don't think I've ever owned a shaker- they are wholly impractical as far as I'm concerned. I must say, though, that I am currently lusting after a set of Artichoke form silver salt shakers and pepper grinders- gorgeous, but so expensive I may have to take out a mortgage to bid on them. If I'm successful, I may just change my lifelong aversion to the shaker. By the way, for you would be pinchers, William Yeoward makes some really attractive reproductions of the Georgian originals. Pinching or shaking, such a marvelous topic to ponder. We "shook" for years but now we "pinch" from a lovely wooden bowl that seems to keep the fleur de sel just right. It is next to the olive oil and the vinegar and pepper mill. I have a silver salt shaker but salt has taken it's toil. One has to empty and re-fill....polishing in between housing the salt. I much prefer the pinch the finest salt. Perhaps they are; however, I will always appreciate lovely entertaining with lovely old things! (She and her husband also have at least one "bash" for 250 people outside at their house for all ages.! )....barbeques....sports......the whole casual shebang.......every Memorial Day! babies to great-grandparents....and they all love it! I find this the best of all worlds (not biased at all)! HA! Well, you , of all people can imagine how fun and heartwarming it is for me to see all those familiar "formalities" "amenities"! I LOVE IT!! Those traditions.......remind me of an earlier time......when my mother had formal dinner parties every Friday night! "May I buy all those salt spoons?" I said; (completely bewildered by the entire question and all of it!) "Oh, no! They were my mother's and they all match the little salt bowls. Why would you ask?" "He said; I can't find enough of them....they are just perfect for cocaine!" I nearly fell off my chair! Now, Reggie. Pasadena California is about as "Eastern Conservative"
I damn near keeled over! No wonder they are hard to find! Hang on to them! You may make a killing on ebay!